Sixty-four small children lined the Western Montana Fair's rodeo arena for the chance to ride a sheep Tuesday afternoon. First on wool: Tyler Burden, 5. "I'm going to hold on tight," Burden promised. His sheep - Wooly Wanda - spun in a circle, then stopped. Burden held tight. The buzzer went off after eight seconds and Burden made the finals. But he did not win. The winner of the fair's first-ever Mutton Bustin' event was Austin Bisom, a 7-year-old from Missoula. He rode his sheep the required eight seconds during the first go-round, or "long run," then stayed on the longest in the finals, or "short run." Fair marketing agent Gretchen Kirchmann proclaimed this year's event a "huge success." "It's wild and wooly," she shouted over the din from several hundred spectators. "The crowd is really excited." Kirchmann said the fair introduced Mutton Bustin' - an event where kids ride sheep - to this year's schedule to coincide with the 2010 theme, "Wild and Wooly." 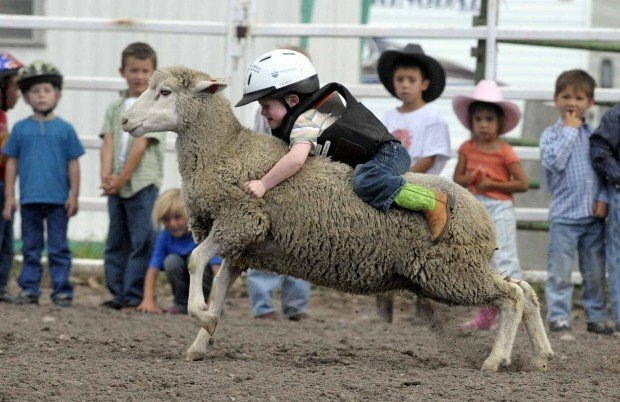 Although some kids held on tighter than others, the success of a ride had more to do with the sheep than the rider. After Burden clung to slow-moving Wooly Wanda for eight seconds, 6-year-old Brandi Twardoski mounted a considerably faster sheep named Curly Locks. The sheep took off, and off flew Twardoski. "It's the luck of the draw," said announcer Will Rasmussen over the loud speakers. World Champion bullfighter turned rodeo announcer Rob Smets helped Rasmussen provide commentary from the arena. But his presence on the ground was also to make sure each kid truly wanted to ride. "You don't want kids down there that don't want to be there," Smets said. Sure enough, several children made it to the front of the line - helmet and safety vest in place - only to panic at the sight of an unruly sheep. Smets would watch the children getting ready to mount - microphone off. "Do you want to do this?" he asked a boy already sitting on a sheep. "No," the boy said in tears. "He doesn't want to, if he doesn't want to don't make him," Smets told the men holding the sheep and the boy was lifted off. "He's going to wait until next year," Smets said into the microphone. Of the children who chose to ride, some had softer landings than others, and each crash was met with a collective cringe, "oof," from the audience. And if a rider landed in tears, either Smets, a sheep wrangler or a rodeo pageant contestant would rush to hold the sobbing youth. "I rode (a sheep) before," Burden said. "I fell off and I had to cry almost the whole way home. It knocked the wind out of me." After an uneventful - but successful - first ride, Burden was in the finals. "It was funny (my sheep) didn't run," Burden said. "I don't want it to run. I don't want to get the wind knocked out of me again." Burden chose to not participate in the finals. The two girls with qualifying times also chose not to ride a second sheep, which meant there was no top girl at this event. The top boy, Bisom, won a trophy belt buckle. 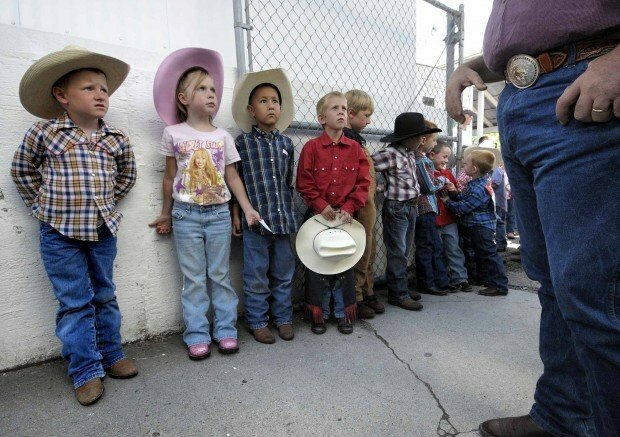 There will be a second Mutton Bustin' event on Saturday in the arena at 6 p.m. Parents can register their children for the competition at the Bitterroot Booth next to the Ice Arena. Jessie Higgins is a fourth-year student at the University of Oregon who is interning this summer at the Missoulian. She can be reached at 523-5251, or jessie.higgins@missoulian.com.